Will Tesla Stock Drop Under Trump? Subject: Will Tesla Stock Drop Under Trump? President-elect Trump made American energy independence a centerpiece of his campaign, and now investors want to know whether Tesla stock will drop under Trump. To be sure, the election has already impacted Tesla stock. The Tesla Motors Inc. (Nasdaq: TSLA) stock price dropped nearly 6% in the week after the presidential election, signaling investor unease. Many fear Trump's win will lead to a more favorable climate for fossil fuels. Others are skeptical about the need for renewable energy. But Trump's impact on the Tesla share price isn't so simple. Tesla has benefited from several government subsidy programs for green energy, which many investors fear will disappear during the Trump presidency. Trump's primary energy focus is reducing restrictions on coal mining and oil and gas drilling. While Trump's encouragement of the fossil fuel industry might weaken Tesla's position as the future of energy, it's Trump's position on renewables that has Tesla investors worried. Trump has criticized solar energy as a poor investment and plans to withdraw the United States from the Paris Climate Accord, which has encouraged the use of renewable energy. This could be a big deal for the Tesla share price. 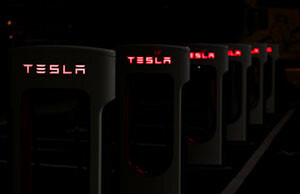 The Tesla merger with SolarCity Corp. (Nasdaq: SCTY), another of Elon Musk's companies, has just been approved, and Musk hopes the combined companies "will target homeowners in a bid to sell Tesla's all-electric vehicles, solar panels, and batteries, enabling customers to power their cars and homes with clean energy," The Wall Street Journal reports. But Tesla and SolarCity have relied on consumer subsidies to make their clean energy products competitive. Tesla has benefited from the sale of zero emissions credits to other companies. In 2015, the Los Angeles Times reported that between Tesla, SolarCity, and SpaceX, Elon Musk's companies receive $4.9 billion in government subsidies. Currently, buyers purchasing Tesla vehicles are eligible for a $7,500 federal income tax credit. That drops the price of their new Model 3 to $27,500, making it competitive with traditional automobiles. Subsidies also help both Tesla's battery division and SolarCity. Tesla's "Powerwall," a battery than can power a home, makes converting to solar power for homeowners more practical. Musk hopes by merging Tesla and SolarCity, customers will be able to buy both the solar panels and batteries all at once. Money Morning Director of Tech & Venture Capital Research Michael A. Robinson says "tax credits are still a big driver in the solar market, particularly for homeowners." The Investment Tax Credit gives homeowners a 30% rebate on a solar power project. However, Tesla's profits could be cut if the Investment Tax Credit isn't renewed. That's why investors are worried about whether Tesla stock will drop under Trump. While it would be a blow to Tesla if fewer buyers could afford its products, there's more to Tesla's stock price than that.